Heads of state, public figures, and celebrities gather in Jerusalem to mark the 90th birthday of Israeli President Shimon Peres. Heads of state, public figures, and celebrities gathered on Tuesday in Jerusalem to mark the 90th birthday of Israeli President Shimon Peres. The lavish celebration was attended by Prime Minister Binyamin Netanyahu, former US president Bill Clinton, former British prime minister Tony Blair—to name a few-- and included a performances by legendary singer Barbara Streisand, who sang “Aveinu Malkenu”, and Israeli hit Eyal Golan. "Shimon you prove that it is possible to be curious at any age and young at any age," said Prime Minister Netanyahu during opening remarks of the ceremony. "Shimon Peres has devoted to his life to building Israel and building peace. A strong Israel creates the conditions for peace,” the prime minister said. "We in Britain have our queen, and you have your Shimon," added former British Prime Minister Blair. US President Barack Obama, German Chancellor Angela Merkel, the Spanish King Juan Carlos and Russian Prime Minister Vladimir Putin—who were not present at the ceremony also praised the Israeli president for his accomplishments on behalf of peace, Zionism and humanity. President Peres thanked the esteemed crowd for gather in honor of his birthday celebration saying, "I am moved to see so many people who have been with me along the way." 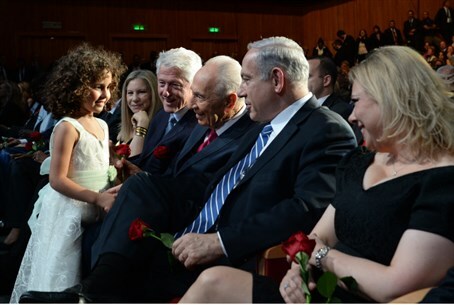 "I know you have come to Jerusalem from around the world to pay tribute to me and with me to tikun olam," Peres said.